At first I was tempted to call this tutorial ‘Fabric Paper’, however it would appear that there are already several tutorials on the web about fabric paper. It seems a cheat, though, to just slap paper onto a fabric and call it ‘fabric paper’. The technique I’m going to describe here really does make paper into a surface that can be used like a fabric – but there is no ‘fabric’ in sight. Materials and Equipment. These are simple, but relatively specific. Firstly, you will need a plastic surface on which to work. I use polythene – a bin liner is fine, but for the purposes of this tutorial I have used a clear plastic bag to give a lighter background for photographs. It doesn’t matter if it’s crumpled – but just be warned that if there is paint residue from another exercise you could find that this transfers to your surface. Does this matter? You can decide when you have read through the rest of the technique. You will need a paintbrush and some glue. I don’t use a large brush, as sometimes the pieces of paper you are dealing with are small, however, make sure that it is cheap and cheerful as we are using an acrylic based glue, and the brush will be damaged if you don’t wash it with great care as soon as you finish working. Liquitex Matte is my preferred medium. You can also use PVA which has been diluted to the consistency of thin cream, but the result is not quite so durable. We’ll come back to the paper in a minute. You will also need a selection of pieces of coloured tissue. I use tissue of all weights that I have coloured myself. 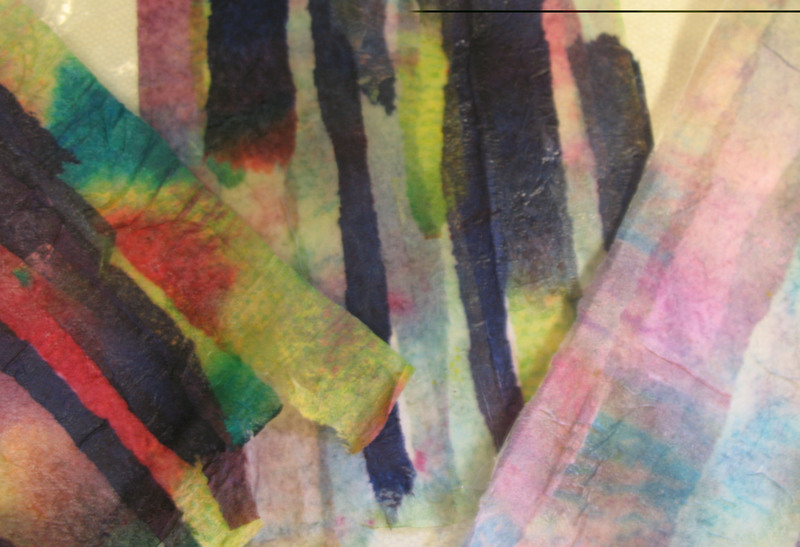 Have you ever tried to colour your own tissue? 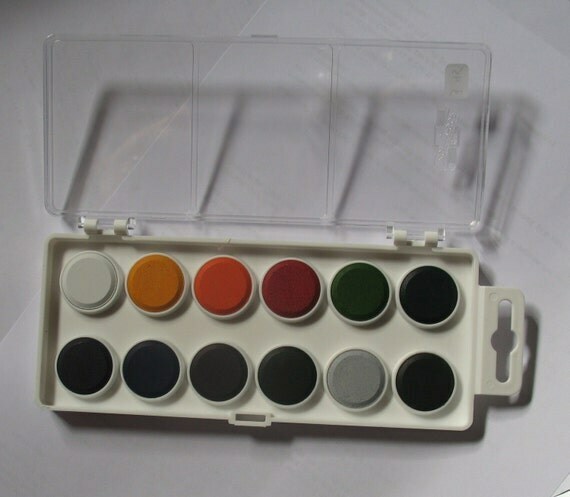 It’s fun, and these paints are ideal as the colour is intense. They are water-based, and totally intermixable, so the effects are endless. The papers I’m using in this post are all coloured with them. You will see that I have used some in various intensities, including a very dilute form. You can also include purchased paper serviettes or napkins. There’s that other paper again, it’s the ‘secret’ ingredient, so we will talk about it soon. Whichever paper you use make sure that it is completely dry before you start this following exercise. Abaca tissue is available in several weights. It is PH neutral, and has no grain so tears with ease in whichever direction you need. However, the one that I use (also known as Conservation Tissue as it is used for wrapping textiles etc for long term storage) is far and away the best and most stable for this technique. 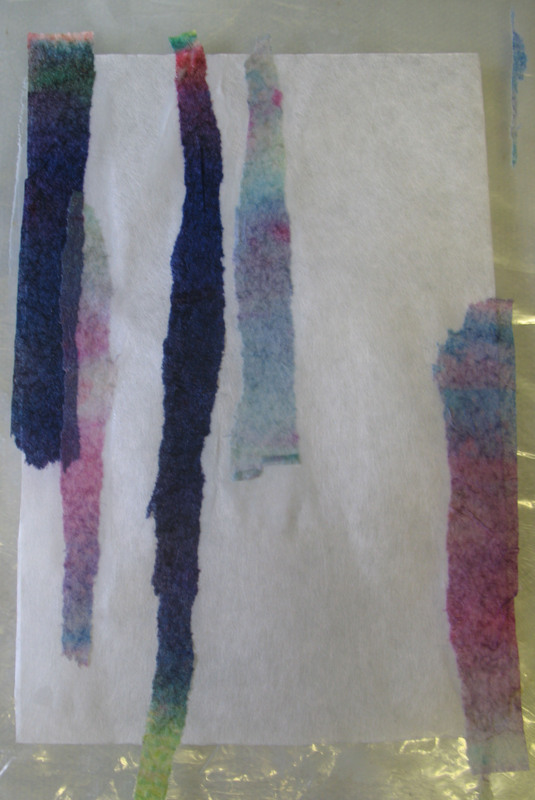 It too takes colour beautifully, and you can include it in the tissue used for this technique. I have also used it as an addition in the various collages that you can see here and here. 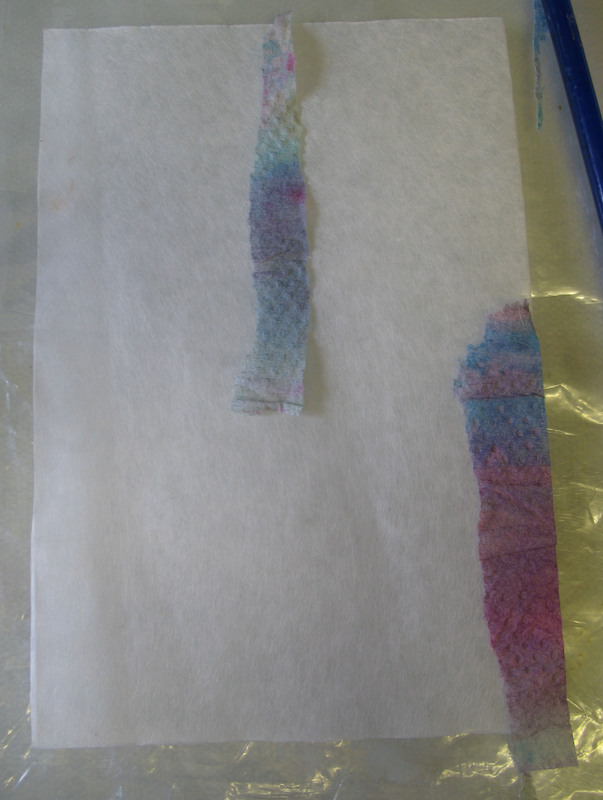 The secret to this technique is that the tissue is built up on a base of this wonderful tissue paper, and it then becomes strong enough for stitching! So, off we go. 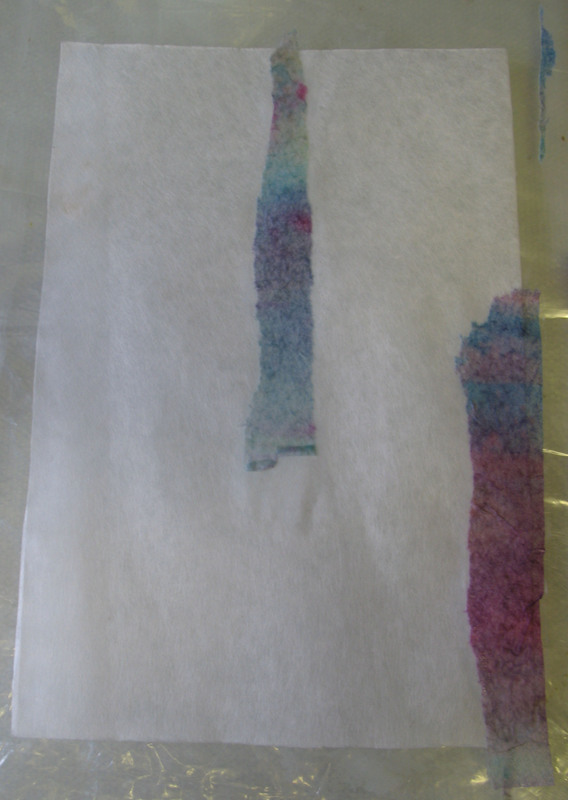 Place a piece of the conservation tissue onto your work surface and begin to tear your coloured paper into strips. Lie them on the background, a very few at a time, then paint them liberally with the matte medium. 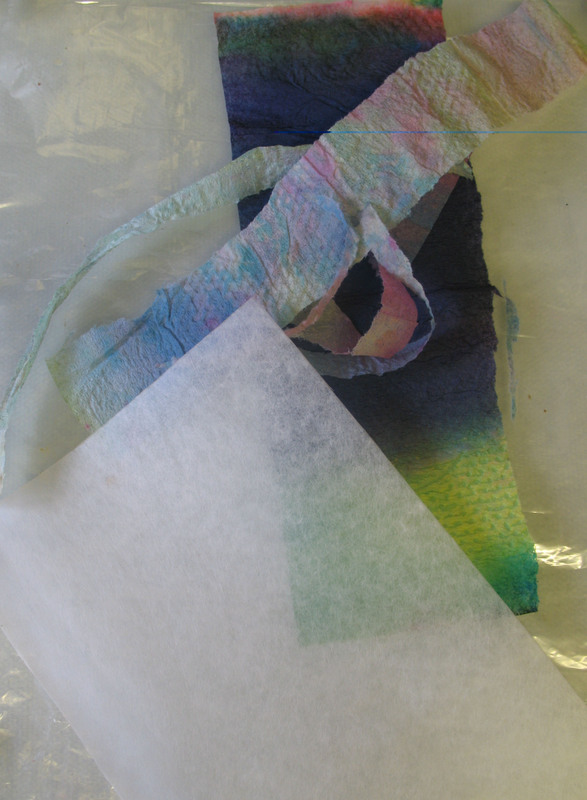 The coloured tissue will stretch and may crumple. That’s fine. The important thing is to make sure that each piece is thoroughly coated, so that the medium soaks right through to the backing paper. Continue to add strips a few at a time. It’s a mistake to arrange everything and then ‘paint’, everything will move and you will become frustrated. Overlaps are fine, if the paper is coloured and covered properly more colours will result which is fun. Keep going until the backing is covered. I leave the edges until the very end, then I trim them if need be. When it’s completely covered leave it exactly where it is and walk away. It needs to dry totally, then it can be peeled from its backing plastic. 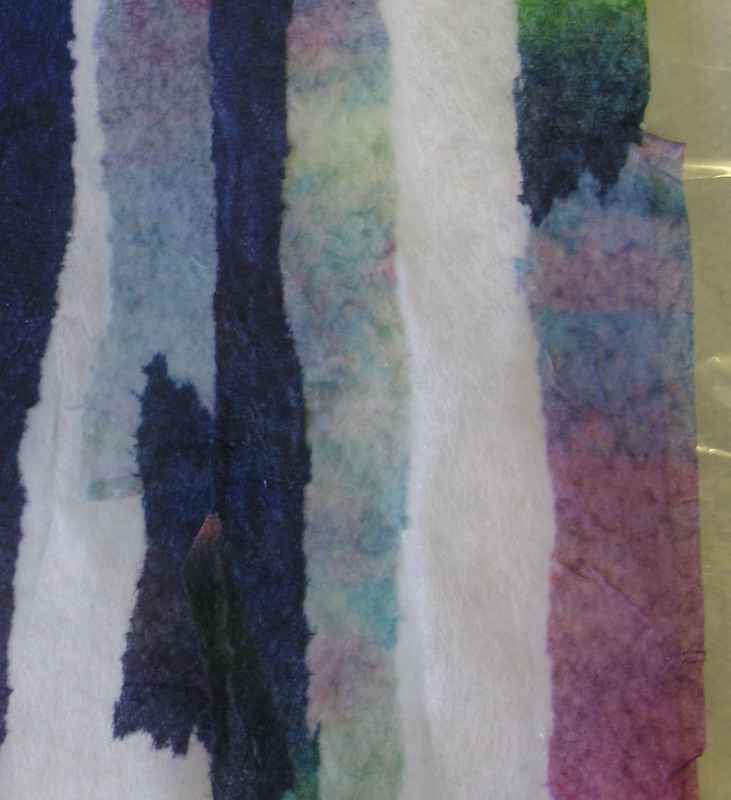 Above is the reverse of part of the paper fabric after it has dried. See those white ‘flecks’? That’s where the matte medium hasn’t fully penetrated. Tiny areas like this are OK, but large areas will just pull away. That’s why it’s important to work the medium into the layers as you work little by little. Here’s the same part from the other side. Can you see the shaded areas where the pieces have overlapped? They add to the interest of the finished piece. Make several and then you have a selection ready to use. Try to co-ordinate them to a certain extent, for instance, one dark, one light and one mixed. When you use them together they will blend well. I usually leave the papers overnight to dry. When they are ready they can be folded, pleated, manipulated in a variety of ways. They can easily be cut with scissors, and can also be used in ‘cutting’ machines like the cuttlebug. Use them for book covers, with or without stitching, as panels within other works of art, as a surface for making bags, boxes or other 3D items. I don’t trim them until I know I’m going to use them. The overhanging bits, presuming they are covered with medium, make useful additions to another surface and can be added to cards etc. 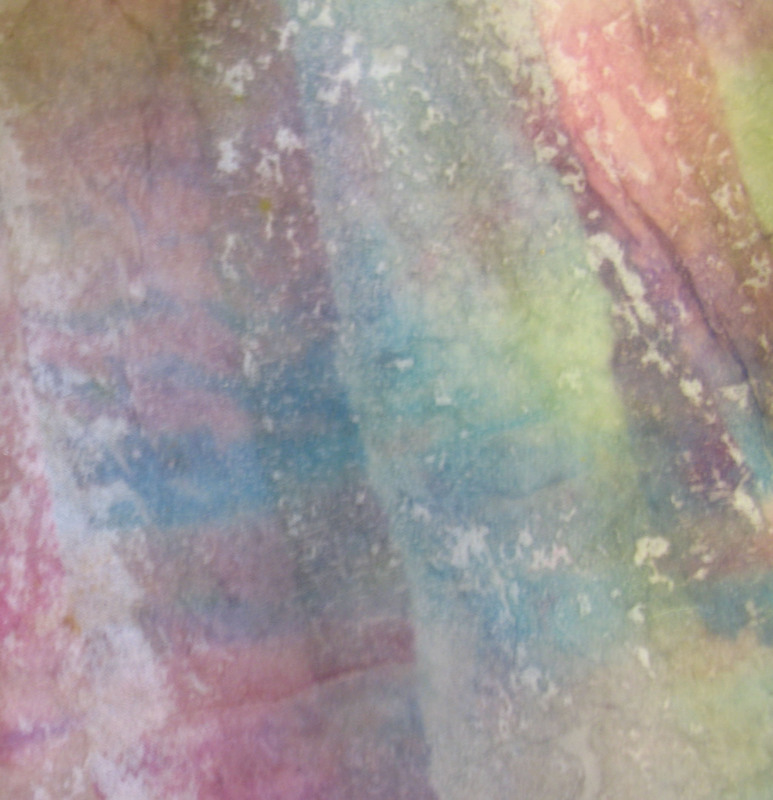 If you decide to buy the paper or the paints from the links above make sure you let me know and I’ll include a small piece of my hand-dyed tissue in your package. Have fun – that’s the main objective! (Oh, and if you want a really special metallic finish to your paper fabric why not give a quick squirt or two of one of these metallics while the matte medium is still wet! Copper, Antique Gold, Bronze, Gold, Silver. Of course, you can use these in many other ways too, but they ARE good for this technique! Amazing technique – thanks for sharing! 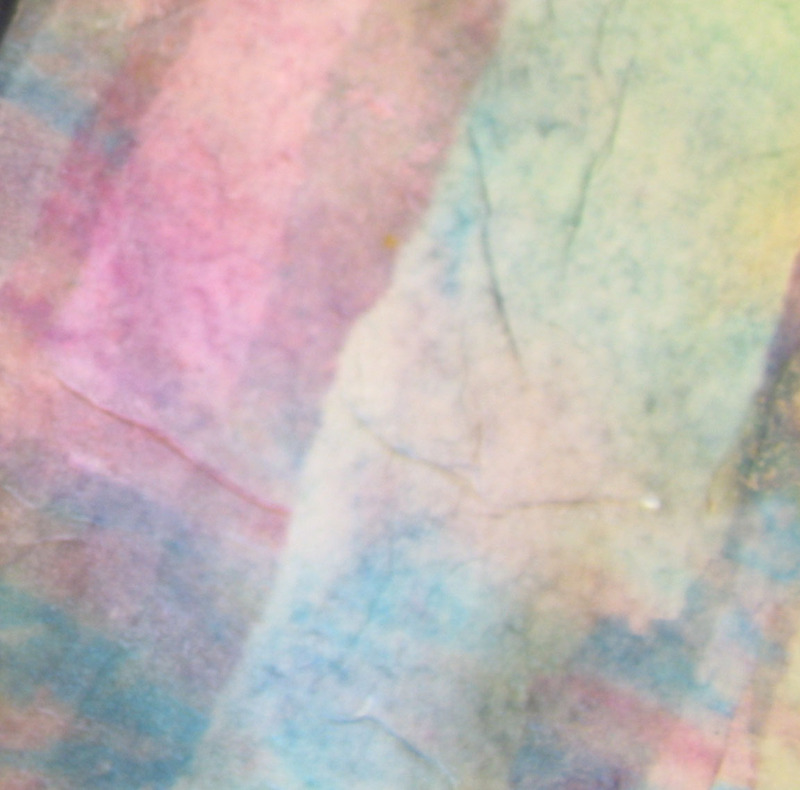 hi – I’ve been doing this also with normal tissue paper and acrylic gel to seal in much the same way. I put a layer of acrylic gel on the plastic first the get a good seal, it makes the revers a little shiny when it’s all dry but I don’t worry about that too much. I also highlight with gold or silver wax, treasure wax i think it’s called – it’s great fun! I think your special tissue might saved some time and layers though as the cheap tissue does disintergrate easily. Yes, that would work too. No need to put the gel on the ground first, the seal really is good using the abaca tissue. Using the metallic spray gives an unusual effect, and is more subtle than wax. I think you might find the matte medium is less destructive than acrylic gel too. Over the years I’ve tried all sorts of techniques, but I keep coming back to this one. Thanks for taking the time to comment. 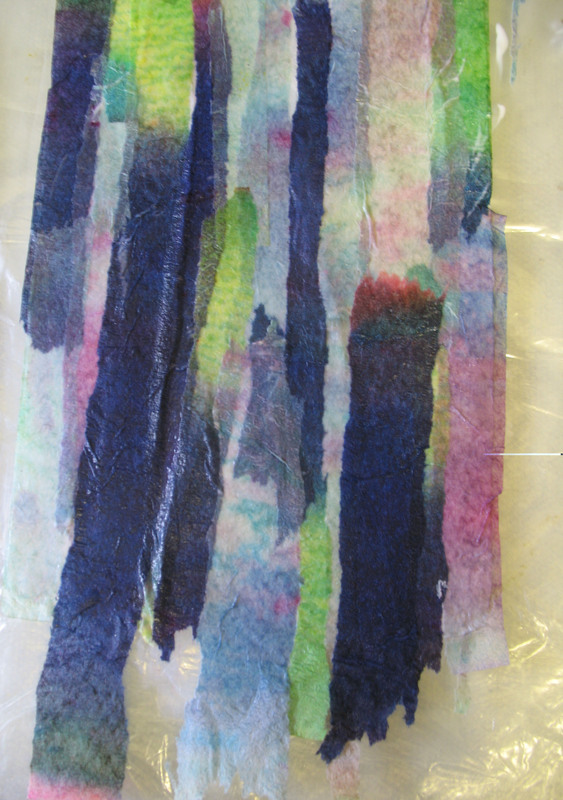 just used the conservation tissue along with my normal tissue and wow, really pleased as it didn’t break up and looks really promising to use – must let it dry first!! What fun!! You are inspiring me today, on a day when I need to keep my nose in the computer getting better at adobe illustrator! I may sneak into the studio at some point. After all, can’t just sit all day! Love this also, I have used normal tissue and PVA glue, normal tissue and Acrylic Matte Medium and much prefer the latter as you don’t get the sheen a PVA gives unless it is watered down a lot, even then the plastic side always gives a smooth sheen when using PVA. Love the strip idea, must try it. Oh I think I know someone who will love this. Can’t wait to give it a try, thanks. Glad it can be found useful. Would love to see some results. I’ve done this before. It’s fun. I use tore up pieces of used wrapping paper for some fun effects. It was interesting to see yours. A slightly different twist. I’ve thrown glitter into mine too. Thanks for visiting and commenting on my blog. Looking forward to your ATC from Swap-bot. Well, I had a great time. I painted the tissue with acrylic inks, which was difficult. 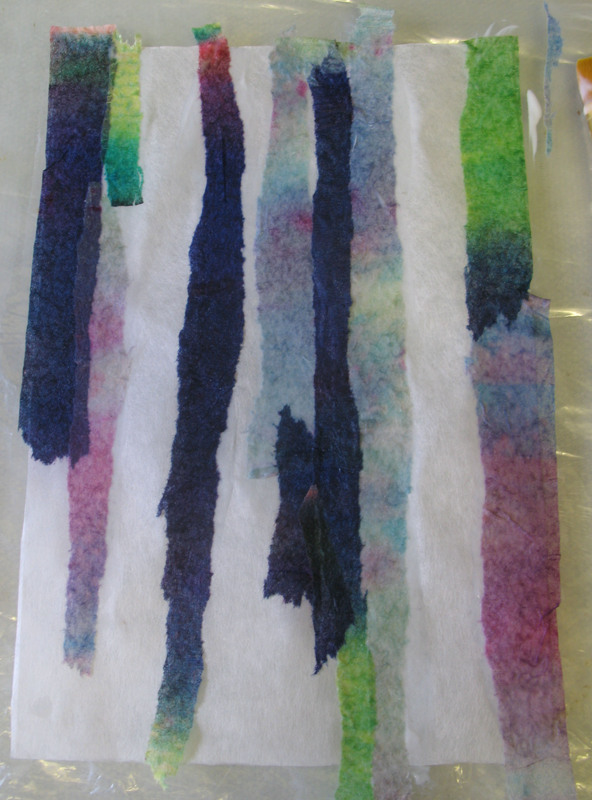 When dry I tore the paper into strips and glued down onto kitchen roll using watered PVA. Next I sprayed with gold paint, gently, and stitched with gold thread..wow. Will finish tomorrow and can’t wait to see the end result. Thanks. It works 🙂 If you use it please let me know, I’d like to see. Great tutorial Thank you! Just wondering but I’m guessing this can’t go in the washer after it’s done? I wouldn’t put it in a washing machine. I think I’d just use it for a decorative project. There are other ways of making a fabric suitable for washing – but the colour might always be theproblem unless properly dyed. Glad you enjoyed it – and thanks for commenting. Let me know what you do, Sue. Thanks for dropping in. 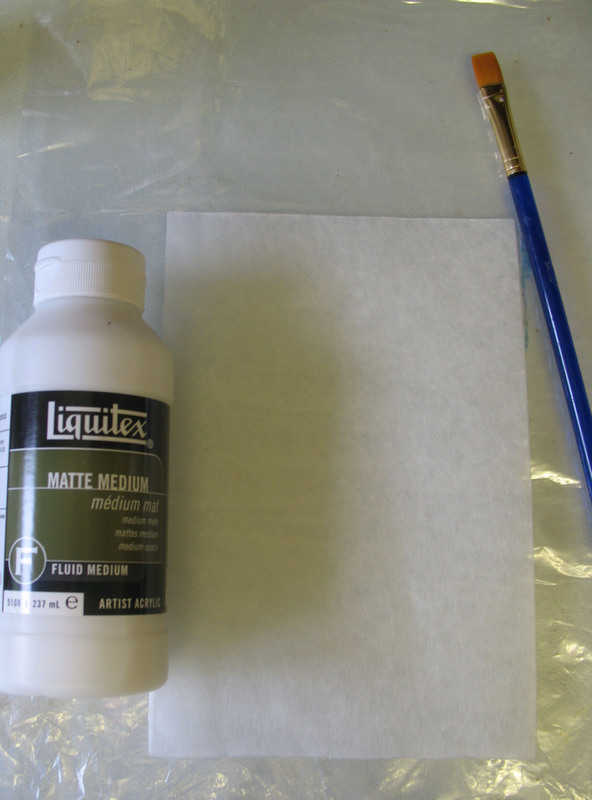 Have got my supplies and ready to go ……can’t wait to see what happens .Thanks for the link for the Liquitex. Not sure what I will do with it until I have the finished paper . Thinking lampshades at the moment ?